Welcome to the AE911Truth online store! Double-Disk DVD! 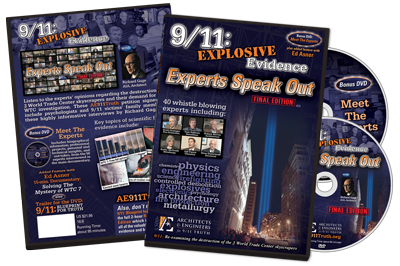 9/11: Explosive Evidence - Experts Speak Out. The powerful new documentary film by Architects & Engineers for 9/11 Truth in a presentation case. Best Documentary Feature" and "Award of Excellence" Awards. Architects & Engineers for 9/11 Truth (AE911Truth) is a non-profit corporation. We are a non-partisan association of architects, engineers and affiliates dedicated to exposing the falsehoods and to revealing truths about the destruction of the 3 World Trade Center skyscrapers on September 11, 2001.